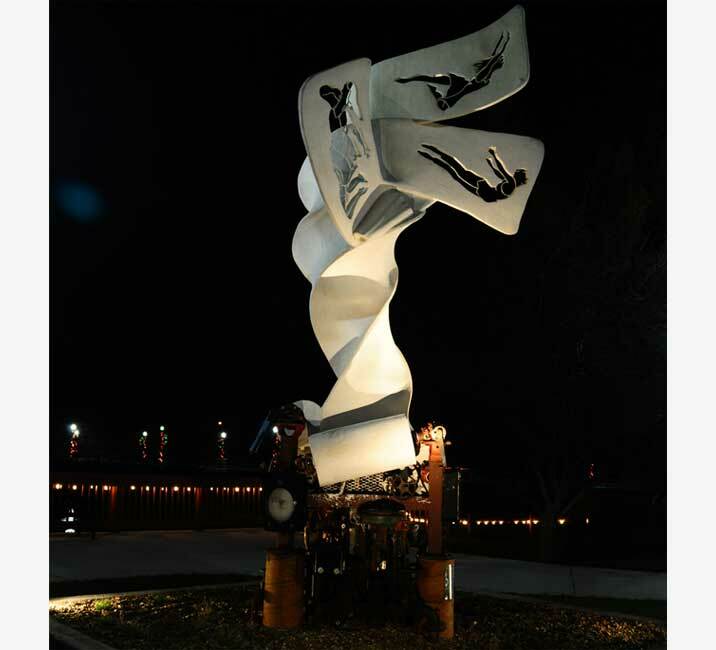 2012, cast concrete, iron and steel, 23 feet high by 12 feet by 10 feet. The Renaissance Race GFRC concrete structure sits atop one ton cast of iron mill components that came from the old paper works. 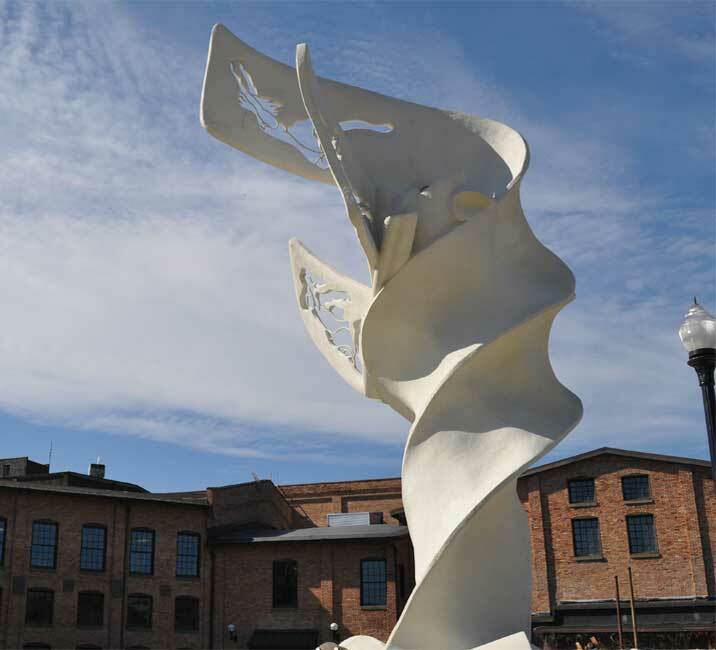 Paper production is represented in the form which spirals skywards flowering out with cut out silhouettes of young dancers representing the new generations that will inhabit the city and enjoy the re-purposed premises. Gauges, meters and various iron components form a plinth beneath the paper rolls spattered with pulp like many components were in the old mill. 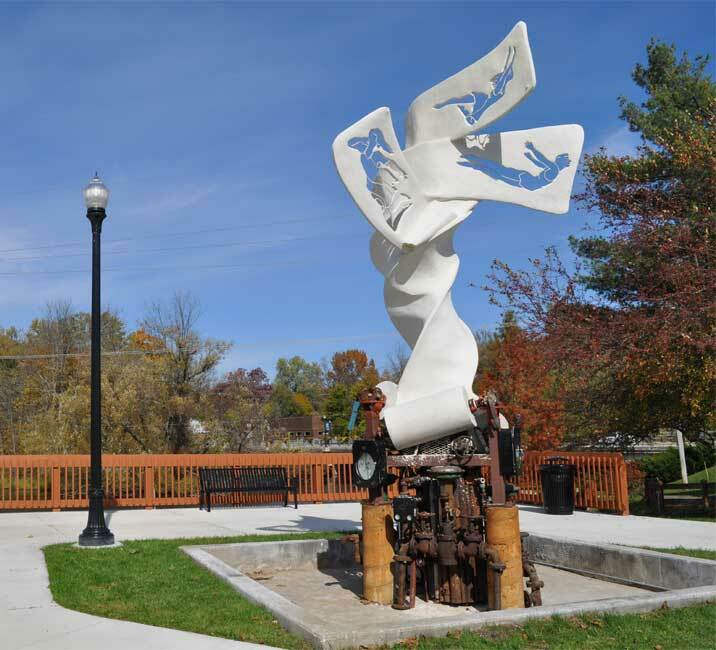 The Renaissance Race installation is in the paper mill town of Plainwell, Michigan between Grand Rapids and Kalamazoo, on the Kalamazoo River. Plainwell, Michigan was a classic mill town, period Plainwell’s residents worked at the mill and it was the central focus for 145 years, then it closed. The city was founded with the construction of a canal in 1861 called the "Race" that powered a paper mill. ("Race" is actually a 19th century term for a canal that powers a mill). The race cuts through the landscape from the Kalamazoo river and creates a border for the city. The mill ran continuously until 2006 when it was shuttered and slated for a major clean up. The city partnered with an environmental firm to purchase the site and is renewing the structure to become the city "Epicenter". A rebirth was needed to renew the community’s spirits and lift them from the depression of job loss. Bold new steps were taken toward revitalization and focus on the assets at hand for a new vision. The City is an easy commute to two West Michigan cities, Grand Rapids and Kalamazoo. 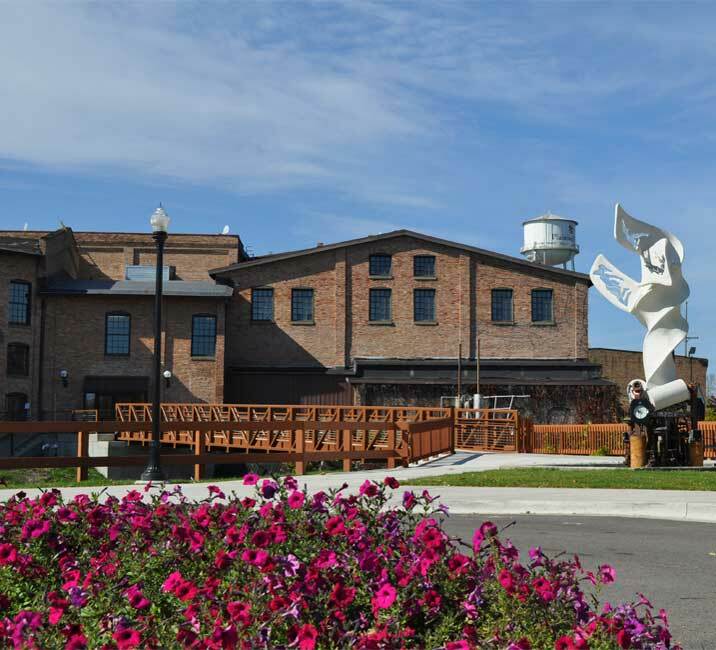 The Clean up funds for the mill site enabled the city to purchase the property and plan a cool city center right on the river at the "Race" dam site. The race itself enables a kayak run and some fishery concepts. The work began on a true rebirth of this place. 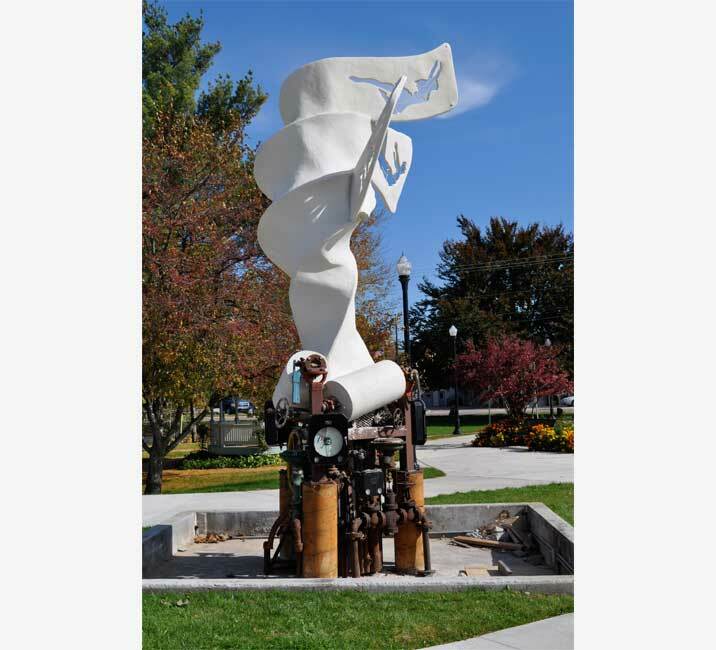 The city started a sculpture program and wanted the first piece to commemorate the site, the mill and also inspire toward the future for it’s residence. The commission: A competition was created for a work of art. The finalists were allowed to tour the old mill works and select objects that they might use in their sculpture designs. They presented proposals to the residence for a public vote. Tj’s piece was chosen. 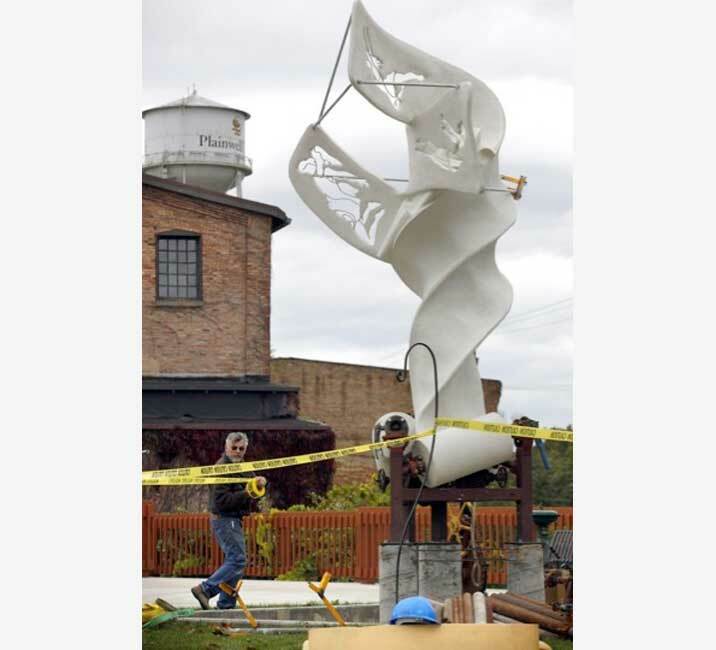 Renaissance Race was commissioned by the Arts Council and City of Plainwell Michigan. 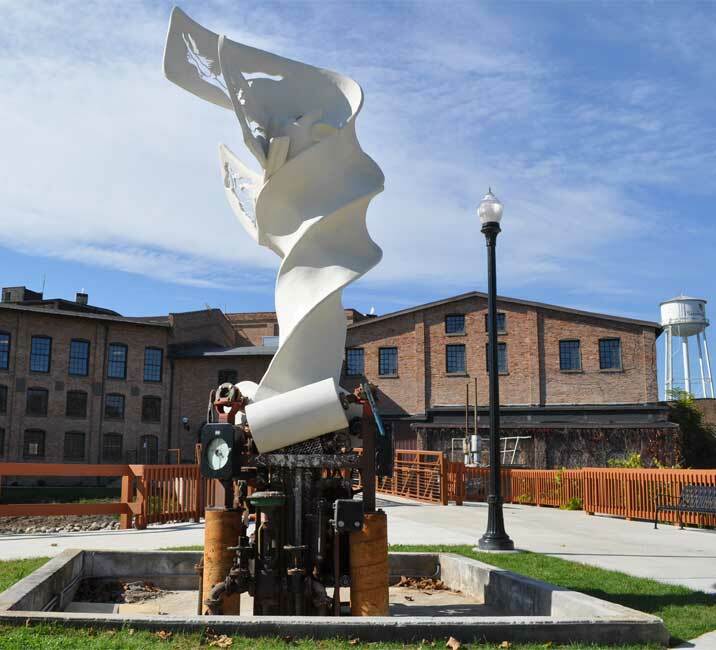 The Sculpture is positioned at the point where the original wooden water wheel had been to power the mill, and directly in front of the new city hall. Tj worked with city management to enable more than the original bargain. 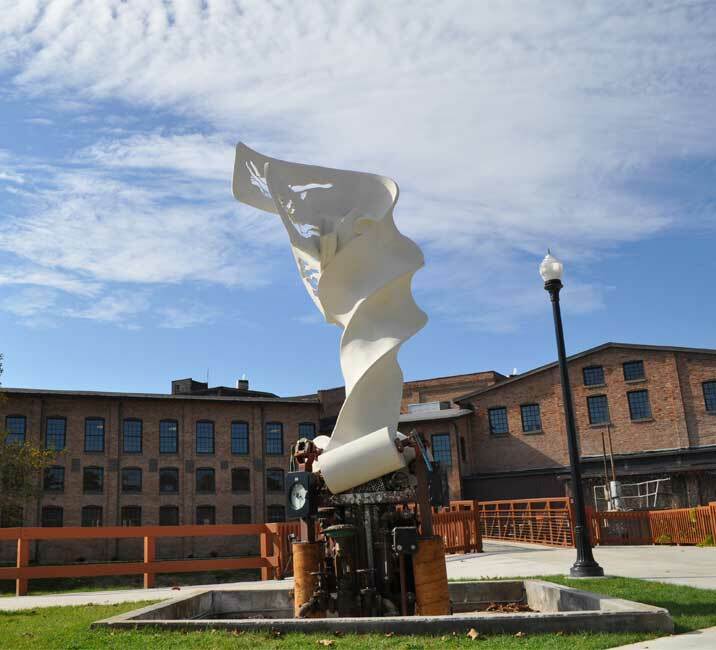 At Tj’s direction, the city provided all the salvage and decontamination of the mill components, all the foundation prep and construction, all transportation of the components stop. They then transported finished work and provided all equipment and labor to crane the piece into place and assemble the plinth components. Finally, the lighting and landscaping to finish it up were also done by the city. This enabled Tj to focus solely on the artwork and create a much larger version than the original commission.